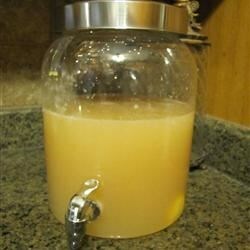 "This punch was made famous by one of the ladies in my Bunko group, but has now become a favorite for all occasions! Add frozen, chopped fruit chunks to the mix after 'slushing' for a healthy (ha ha) boost!" Mix together the tea, water, vodka, orange juice concentrate, and pink lemonade concentrate in a large freezer-proof bowl, such as glass or stainless steel, and freeze overnight or several days ahead. With a fork, scrape the frozen mixture into a slush; pour the grapefruit soda into the slushy mixture, and stir. Keep cold in an ice chest. Sail into this delicious sunset punch. It was terrible. No one drank it. Served at Bunko and was a hit! This punch is not overly sweet. Had to buy a 12 pack of Fresca, because I couldn't find the two liter.